Striking a balance: Conservation vs Industry in a treatment of coining tools from the Perth Mint. 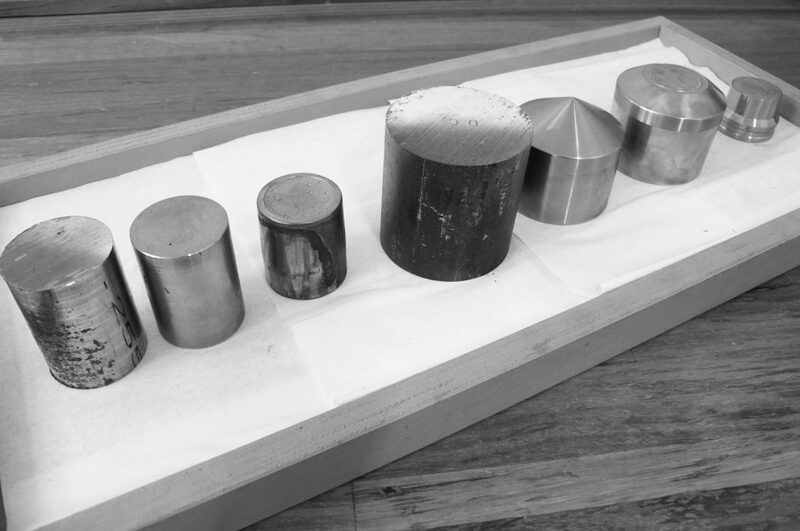 Coining master tools from the Perth Mint have finally arrived at the Grimwade Centre for Cultural Materials Conservation at the University of Melbourne where they will be undergoing a month-long treatment and analysis on corrosion products forming on their surfaces. These tools are part of a collection of the Mint’s manufacturing output since 1986 (Goldcorp 1999). Despite careful storage by tool makers and fabricators, the collection is exhibiting the full rainbow of known iron corrosion products. It is thus likely that this initial treatment will lead into and inform a mass conservation project of these objects over the coming months. Masters, matrices, reduction punches, hobs, working hobs or hubs are just some of the handful of names used for these tools, whose precise engineering and artisanal fabrication is crucial in the coin manufacturing process (Goldcorp 2018). Equal parts industrial heritage objects and fine metalwork, they need to be strong enough to withstand great pressure to forge the next steel coining tools, known as dies, whilst also capturing the elegant and minute details of a coin relief design. This image shows the gradual machine working of raw steel billet to produce the master tool (third from left) and the die (far right). Significant collections of cultural materials aren’t always located in climate controlled museums and galleries. These tools are part of the continually growing and functioning manufacturing collections at the Mint and they must remain onsite for ease of access for designers, fabricators and toolmakers. However, the factory setting has proven to be a less-than-ideal storage facility and these tools have been subject to fluctuations in temperature and RH as well as atmospheric pollutants from the industrial processes in the production areas adjacent. The custodians have shown a great awareness of this need for preventive care and have started to move the collection to a more stable environment on the East Perth premises, to both facilitate daily access and hopefully stabilise the corrosion process. They also have requested storage recommendations as well as conservation assessment of the industrial wax currently used to coat them. If the current coating is deemed unsuitable, part of the treatment will incorporate suggesting a suitable and sustainable conservation grade alternative corrosion inhibitor. The custodians have also requested that any proposed methodologies are practical for a mass conservation treatment of the remainder of the collection. This eliminates methods and materials that are too costly in financial terms, human resources and environmental impact and treatments will be devised this month to allow for these logistical considerations. Conservation decision making and corrosion- to treat or not to treat? Steel corrosion is a big problem in both industry and cultural materials conservation. In fact, a fifth of global iron production is used to replace rusted steel in industry (Zumdahl & Zumdahl 2007). Because of this, corrosion prevention couples nicely with sustainable best-practice in both fields. Not all corrosion products are made equally and they don’t necessarily spell disaster for metallic objects. The CCI identifies passive or stable iron corrosion as compact and adherent, varying in colour from blue-black to red-brown and isn’t necessarily harmful to material, sometimes even acting to prevent further corrosion. Active corrosion is identified as flaking or powdering, voluminous and varying in colour from browns, to yellows to bright oranges and reds and is usually more destructive(Logan 1986). Its removal is irreversible; an action more in line with traditional concepts of restoration than with the contemporary principles of minimal intervention in conservation practice. Common treatments of corroded metals, particularly archaeological iron, are to stabilise and convert active corrosion products (Logan 1987). This preserves the distinctive markings and ensures that no further damage from oxygen and moisture occurs. However, the Perth Mint custodians would like the corrosion stripped from these tools altogether. They are concerned that the technical specification is obscured and the corrosion is masking the fact that they are significant cultural and industrial heritage items. The damaged objects look like scrap metal, increasing their risk of being accidentally discarded. The request for a more restorative approach than contemporary conservation usually favours has required an in-depth investigation of what corrosion is, what it can tell us about an object or collection’s history and when is it ethical to remove it entirely. Treatment methodology- the fast and the furious. These seven tools were selected for this initial, somewhat experimental treatment because they represent a cross section of the corrosion products seen throughout the collection from the compact, tightly adhered brown corrosion visible on tools 1 and 2, through to the friable, red iron corrosion visible on tools 5 and 7. This treatment required a lot of thinking, planning and preparation as once chemical treatments of metal objects are initiated, subsequent treatment steps need to follow swiftly and smoothly to prevent the treatment going further than intended or flash rust from quickly forming on the newly exposed metallic surfaces (Logan 1987). Dark, blue-black corrosion product is visible in splash like patterns down the sides of the tools. The custodians suggested that this is probably caused by a casting oil being heated during an annealing heat treatment that the tools undergo. This pattern will be preserved as it is probably stable and alludes to the tool’s manufacturing history and usage. Another very compact and black adhesion product was identified around the circumference of 565.3 and being similarly stable and having no physical volume, it was decided to not remove it using potentially damaging chemical treatments. The red-orange rust of Tools 5 & 7 is most likely the active and aggressive mineral corrosion product akagenéite and its vibrant colour and friable surface suggests it formed quite rapidly(Logan 1987 & Selwyn 2004). Tools 1, 2 and 4 have a more adherent, dark corrosion product on the cut surface so after analysis, the decision was made to chemically treat tools 1,2,4, 5 and 7 on the horizontal surfaces only to reveal the technical specification and prevent further losses. 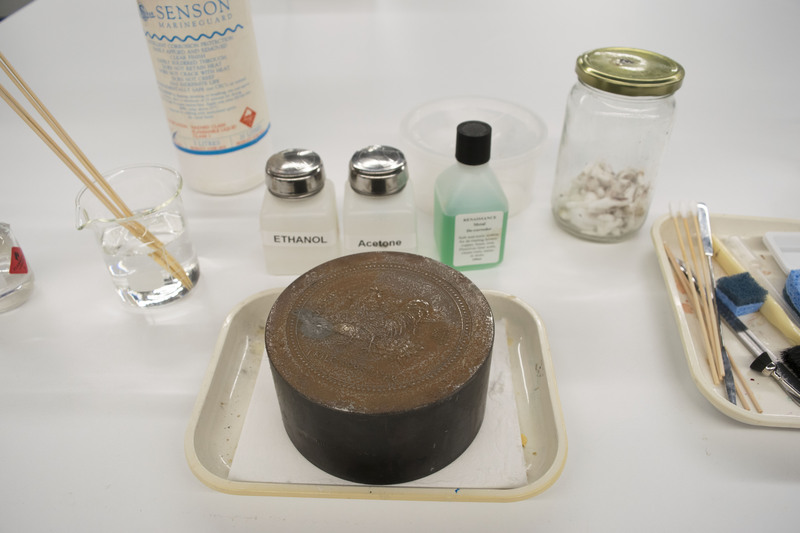 Tools 3 and 6 were smeared with aged grease which was easily removed using petroleum spirits and cotton swabs and there was no need to subject them to aggressive chemical treatments. Tool 4 was addressed next, as it contained a mixture of aged grease concretions and potential pitting corrosion. Cleaning revealed the extent of the corrosion and it became apparent that a chemical treatment would also be necessary. This treatment presented the opportunity to experiment with materials and methods and understand the benefits of preparing solutions in the laboratory versus proprietary rust-removal and inhibitors. Two strengths of citric acid and deionised water were tested, these were effective at removing very loose, friable corrosion but less effective with the more adherent black corrosion in pits. There was also a slight, perceivable colour change of the surface steel which may be acceptable in industry, but not within a conservation context. The proprietary product, Renaissance metal decorroder, was the most effective material tested, with a viscosity thick enough for a controlled application, targeting only the horizontal surface. It solubilised most of the surface corrosion, even the adherent black corrosion that the citric acid solutions failed to shift. A thorough regime of rinsing the tools was necessary to wash all acids from the surface as these can remain in the corrosion pits and continue to attack the metallic structure (Watkinson 2010). The tools were rinsed alternately under running deionised water and a bath of deionised water inhibited with 1% thiourea to prevent flash rusting occurring from the oxygenated rinse water. The surface pH was measured with universal indicator strips to determine a neutral surface had been achieved. All surfaces were dewatered with several passes of ethanol on cotton swabs. This was deemed sufficient and more environmentally sound than employing a solvent bath system. Once dried fully, the tools were coated with Senson Marine Guard for their journey back to Perth, where the coating will be assessed by custodians and can be removed easily with methylated spirits if it is deemed unsuitable for their purposes. Senson’s manufacturing facility is located in W.A. which also supports sustainability if the mint decide to source a bulk amount of the material to continue the mass conservation treatment. And the winner is…conservation or industry? As conservators, the ultimate goal is to provide access to objects amongst other benefits to custodians whilst upholding ideals of preservation and maintaining professional integrity through ethical and risk-averse decision making and practices (AICCM 2002). Requiring a highly interventive treatment methodology to meet the custodians wishes to restore a high-value, newly minted aesthetic, revealing the important technical specification and saving the objects from the scrap heap is a treatment that would push most conservators outside of their professional comfort zone. The artist engravers at the Mint are enthusiastically implementing recommendations made throughout this treatment regarding coatings and ideal storage and they hope to continue engagement with the wider conservation community to ensure that their collections continue to be a viable cultural ­heritage asset for the Perth Mint in years to come. All photos by Claire Rowson, ©2018 The Perth Mint. Thanks to the Perth Mint for generously allowing access to their objects and collections for this treatment. The author also acknowledges Jenny Dickens for her advice regarding metal conservation methodologies and her general expertise in the field of objects conservation. Thanks always to the Grimwade Centre for Cultural Materials Conservation, its faculty and fellow second-year students. GoldCorp 1999, A Century of Minting Excellence: The history of Australian coin production at the Perth Mint, GoldCorp Australia, Perth. Zumdahl, S and Zumdahl, S 2007, Chemistry: Seventh Edition, Houghton Mifflin Company, USA. Horie, C. 1987, Materials for Conservation: Organic Consolidants, Adhesives and Coatings, Butterworths, London. Logan, J 1986, ‘Recognizing Active Corrosion’, Canadian Conservation Institute. Watkinson, D. (2010) ‘Preservation of metallic cultural heritage.’ In Richardson J. A. et al.(eds.) Shrier’s corrosion, volume 4, Elsevier, Amsterdam. Logan, J 1987, ‘Care and Cleaning of Iron’, Canadian Conservation Institute.